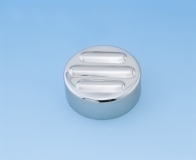 This chrome Cap Cover easily slides over the existing Valkyrie and Magna VF750 radiator cap providing instant shine to the stock cap. Fits Honda GL 1500, Valkyrie and Magna VF 750. 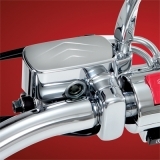 These Chrome Die Cast Aluminum Covers have you covered like never before. They simply slip over the brake cylinder with double sided adhesive and instantly add some flash to you bike. 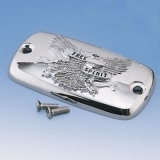 Raised "Free Spirit" engraving with eagle. If you have accessories attached to your master cylinder face clamp, we also have a Brake Cylinder Face Clamp Cover sold separately that matches up with the Honda cruiser brake cylinder cover. The Cover fits all VT600, VT750, VF750, VTX 1300, VT1100 97 - and Yamaha Road Star. Chrome Face Clamp Covers have you covered like never before. They simply slip over the clamp with double sided adhesive and instantly add some flash to you bike. The Honda Cover fits all VT1300 – Fury, Stateline, Interstate and Sabre as well as other late model cruisers like the VT600, VT750, VT1100, and VTX1300. 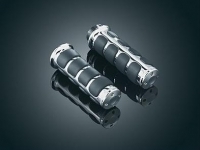 Combining great style and comfort, these grips provide a soft, non-slip surface that dampens operating vibration. Recessed area between the ISO-Pads permit air movement for added comfort in hot weather. 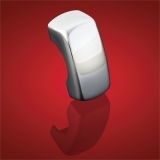 The knurled accent ring adds a touch of class. Accepts the ISO Throttle Boss and its extended version for long rides.